Where do cars with their keys inside get stolen most? The number of stolen cars with keys inside of them is increasing amid an overall decline of vehicle thefts, according to the National Insurance Crime Bureau (NICB). For the same two-year period, 126,603 vehicles were reported stolen with the keys left inside. As a percentage of overall thefts, 5.4 percent of vehicles stolen (39,345) in 2012 had their keys in them. That figure rose to 6 percent (42,430) in 2013, and in 2014, it increased again to 6.7 percent (44,828). "To show the significance of these numbers, if the 44,828 thefts were removed from 2014’s reported estimated total of 659,717, the thefts would fall to 614,889. The last time national vehicle thefts were that low was 1966," says the NICB press statement. In many states – including Colorado, New York, Ohio, Washington and Texas -- you can be cited for leaving your keys in the car while it is unattended and running. Fines for such tickets are typically up to $200 depending on state laws. Beyond the potential for a ticket, leaving your keys in the car makes it an easy target for thieves. Your negligence in having the keys in the ignition may allow your car insurance company to deny your comprehensive insurance claim if the car is stolen. 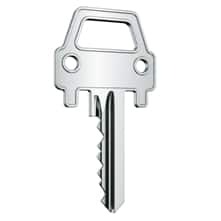 To find out what your state's laws are on leaving keys in your car and the vehicle unattended, whether the engine is left running or not, contact your Department of Motor Vehicles. 2 Responses to "Where do cars with their keys inside get stolen most?" New York statute in this regard also applies only on public roads unless a city, village, or other local jurisdiction has enacted a local ordinance. Washington State's "unattended vehicle" law applies only to "operation of vehicles upon highways." See RCW 46.61.005. Always best, when a word like "unattended" is used, to look for a definition, too. If there is no definition, it may make the law unenforceable. If you have your eye on a vehicle, it would seem logical that you are attending to it. If something deeper were meant, it would seem logical that the law would have stipulated "without a driver present in the driver's seat."